Plastic gear-box motors (also known as 'TT' motors) are an easy and low cost way to get your projects moving. They're low cost, durable, and easy to use. The trade-off for those low cost hobby motors is that they don't have any way of knowing their speed or location. Basically you send voltage in and get rotation out. Really expensive motors have encoders built in, and for these TT motors, we've now got some simple snap-on encoder wheels. 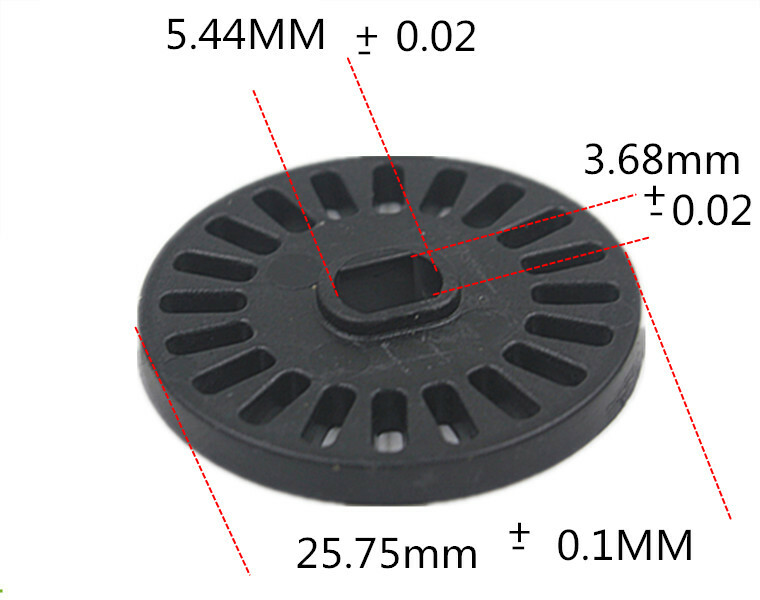 This TT Motor Encoder is solid, but thin, so it won't make your robot bulky. It even comes in Adafruit black! Are they laser-cut stainless steel? No. Do they have multiple gray-code notches? No. But what they do have is black injection-molded plastic that snaps onto the 'opposite' end from your wheel. With a simple photo interrupter sensor to count the ticks, you'll be able to know the speed of your wheel, although not the rotation direction. Each order comes with two encoders. Note: This encoder is only for use with 'TT' gearbox DC motors it's got an oval notch that snaps right in.